Kurt Gerstein’s official mission: ‘improve the service of our gas chambers.’ His personal mission: opportunistic sabotage. On June 8, 1942, with the Second World War at its height, a Nazi officer in civilian uniform entered the Institute of Hygiene in Berlin and was shown into the office of Major Kurt Gerstein. The visitor brought an order from his superior, Adolf Eichmann, of the Reich Security Main Office: Gerstein was to collect a large quantity of a special gas from a secret factory and deliver it to a location in Poland. The gas was Zyklon B, a variant of hydrocyanic or prussic acid, which released deadly fumes on contact with the air. Its use was not discussed. Gerstein already knew. Earlier that year he had received a briefing document about the creation of “necessary” buildings in an occupied Poland “for the gassing of the Jews.” Gerstein suspected that Zyklon B was the means by which the mass murder would be accelerated. But despite his black tunic with the lightning SS collar flashes, Gerstein was no ordinary Nazi. He had joined the Waffen SS to expose its crimes. Now, he would not only be a witness to the horror—he was being ordered to ensure the instrument of murder was delivered to its destination. 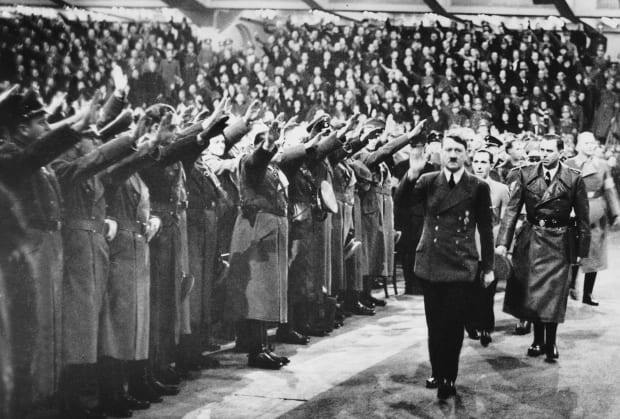 Hitler, accompanied by Joseph Goebbels and Julius Schaub behind him, at an event in the Berlin Sport Palace with many SS members in attendance, circa 1940. When resistance failed, he infiltrated the SS. A tall, slim man with a serious face and dark, penetrating eyes, Kurt Gerstein was 35 when he applied to join the Waffen-SS in September 1940. A quick glance at his record showed that he had the makings of a perfect recruit. He had been born into a deeply conservative household, and both his parents were enthusiastic Nazis. But a closer look at his life suggested both the will and courage to rebel. At school he gained a reputation for truancy and insolence, behavior that brought him into conflict with his father. He found comfort in the Bible and, on leaving school to study to become a mining engineer, spent his weekends writing pamphlets for a national Bible circle.